6 Months Processing: Permanent Resident Visa Application - Gateway to Canada | Canada Immigration Consultancy! Here's a copy of an acknowledgment letter from the Canadian Embassy Manila for one of our clients with an Arranged Employment Opinion (AEO). You want a faster visa processing, too? Continue sending your resume to Employers in Canada! Again, it is always a numbers game. The more applications you send, the better your cahnces will be. 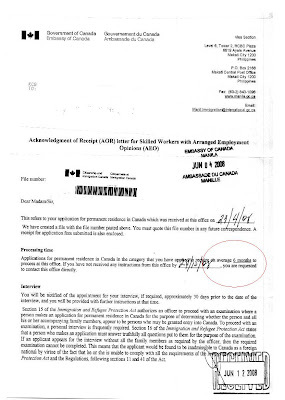 Just be care careful with those that offer guaranteed jobs and visas in Canada.